Little Deep Lake is accessible via an easy 300 m portage beyond Finney Lake. Somewhat remote and inaccessible to most, the lake is a bass angler’s wonderland, offering exceptional opportunities for exceptional largemouth bass fishing. Double-check with the outfitter to determine where the canoe is cached. Deep Lake is connected by a (usually) navigable channel and offers a wide range of structural features – from rocky, fast-breaking shorelines to shallow, soft-bottomed, weedy areas. 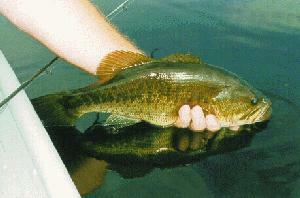 Casting a spinnerbait, topwater plug, plastic worm or crankbait / rattlebait will quickly locate bass. Check weedy sections, near shoreline cover (logs, blowdowns, beaver lodges), at rocky points and along fast-breaking shorelines. Beyond Deep Lake, there are yet other small lakes to explore, but that’s next year’s project !